To me Beat Street is a classic 80’s film that never gets the limelight or remembrance it deserves. Olive Films has chosen this 80’s music drama for release on a lovely blu-ray. It was fantastic seeing this again. I remember watching it on VHS 20 years ago, and it’s been that long since I have seen it. It was a true treat of nostalgia and wonderment that only the 80’s could bring forth. Olive Films has given a new worthy outlet to own this 80's classic for a new generation to discover the musical beat. So many of these awesome 80’s films that dealt with the HIP HOP or Break Dancing world has faded away. Thankfully there are companies like Olive Films to rescue them. Beat Street tells the story of Kenny who is a young, cool, hip-hop musician, who happens to live in a run down, rough neighborhood of New York in the Bronx. Now like most young people, he has dreams, wishes, and desires to be what he loves best, a part of the music world. He wants to be a DJ, and spread his love and passion for the art of music in nightclubs and beyond. He lives with his younger brother Lee, and his mother Cora. As you would guess, you have to enter the crush, the main female lead. The character of Tracy comes from a total different setting. Tracy is a composer and choreographer for the City College of New York. Even though both live differently, they become friends, and Tracy pushes Kenny to follow his dreams. Soon that friendship grows to include a romantic angle. You are introduced to a young cast of dreamers and wishers, those who want to follow what they love best. From Tracy and Kenny’s love of music, to Kenny’s brother Lee, as you would guess, it being an 80’s film, he is into break dancing, and is part of a group that wishes to be the best. Also the character and friend, Ramon, who is a graffiti artist that wants to spread his art all across the city. This is a movie that has the mentality of young dreamers. An 80’s film of Hip-Hop music, break dancing and the style of the city come to life. Kenny is played wonderfully by Guy Davis. Davis is shocking in that he only acted in 9 films/TV. But his real reality is, he is an American Blues musician. His passion for guitar and banjo is what he truly is all about. So seeing Guy Davis in this film and knowing that in real life he is musician, and followed his own dreams of becoming a well-known Blues Musician, is what makes this film shine. Interesting to note, Guy Davis is the son of two very important, and wonderful performers in cinema history, the amazing, beautiful, one of a kind Ruby Davis, and also the spectacular Ossie Davis. Two great parent actors. This also stars one of my favorite performers in films both great and small. The beautiful, vibrant and amazing Rae Dawn Chong. She plays the character of Tracy. Chong has been an actress in many films that stand out, and are worthy to praise. No matter how great or small the part she does, her personality and craft of excellence stands out. Every moment on screen she owns. She creates her characters to be believed. To be forced upon you, to own you. Acting from her seems like it’s nothing but smooth undertaking. She is a flawless gem in performance. One of her greatest roles was in the masterpiece of cinema, The Color Purple (1985). She always is a treat to see and her part of Tracy is one of those treats. This has a slew of real Hip-Hop musicians and a collective 80’s induvial in the world of DJing and culture. The Hip-Hop Grandmaster Melle, Mel who is basically one of the pioneers of rap music. He is part of the original Grandmaster Flash and the Furious Five. The one of a kind original DJ for the South Bronx New York, Afrika Bambaataa. The one and only DJ Jazzy Jay. The beatboxing master and pioneer of the art form Doug E. Fresh. Which might I add he is known as the Human Beat Box. The New York Breakers who originally was known as the Floormaster Crew. They were truly a gifted group of original wonders that took the 80’s to stardom. They were on TV, quest performers and even toured. Part of many Televisions appearances and film appearances. They were, and are a pivotal part of the history and the start of HIP HOP culture. True pioneer’s. This film also has the original Rock Steady Crew. The one and only DJ Kool Herc a.k.a. Clive Campbell. He was the pioneer and the original DJ who helped start and create the start of HIP HOP culture. The amazing group The Treacherous Three. One of the great pioneering HIP HOP groups of all time. 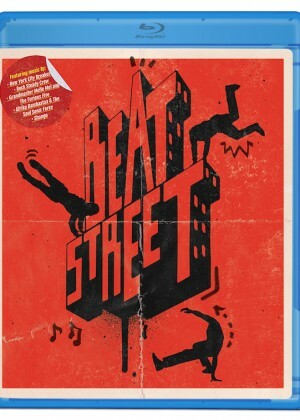 Beat Street is that 80’s brilliance that modern films can’t understand, or touch on the brilliance of that era. Beat Street goes up there with such classics like 1983’s Wild Style, 1985’s Krush Groove, 1984’s Breakin’. These type of movies where landmark films of a growing culture of DJ’s, HIP HOP artists, dancers and graffiti artists. The film has never looked any better. It’s great seeing this film again, and now on a Blu-ray to enjoy. Olive Films has done a fantastic job in picking this forgotten 80’s nostalgic gem of HIP HOP, dance and art. It’s always great adventuring into these older films that bring the 80’s back in all it’s glory. A fantastic Blu-ray to showcase that 80’s generation to a whole new generation. The 80’s was the best in music, dance, expression, and creation of originality, and Beat Street showcases that reality.